Ms. Bularzik teaches three sections of Advanced Placement Literature and Composition and two sections of our ninth-grade Introduction to Literature course. She also serves as the the English Department’s Keys to Literacy coach; the advisor of the BHS Debate Club; and the co-advisor of Spectrum, BHS’s GSA. Ms. Eshelman teachers our Literature for English Language Learners class, Journalism I and II, and three sections of the sophomore Advocacy Through Storytelling course. She is also the advisor for the BHS school paper, The Devil’s Advocate. You can reach Ms. Eshelman by phone at 781-273-7016 or email at seshelman@bpsk12.org. Ms. Janovitz, the BHS English Department Chairperson, teaches two sections of Senior English and one section of ninth-grade Introduction to Literature. She is also the advisor of The Devils’ Playlist, co-advisor for Poetic Ramblings, co-advisor of VIEW, and a member of the District Capacity Project. Ms. Lee showcasing student work on Bloom’s Taxonomy. Ms. MacKay teaches four sections of Senior English and one section of our ninth-grade Introduction to Literature course. She also coaches Girls Varsity Basketball and Girls Varsity Spring Track and Field. You can reach Ms. MacKay by email at pmackay@bpsk12.org or phone at 781-273-7080. Ms. Rose teaches two sections of Introduction to Literature, two sections of American Literature, and one section of Senior English. Ms. Smetana teaches three sections of our sophomore Advocacy Through Storytelling course, one section of Introduction to Literature II Foundations, and one section of Writing Fellows I and II. She is also responsible for developing and facilitating the BHS Student Writing Center. You can reach Ms. Smetana by email at jsmetana@bpsk12.or or phone at 781-238-6888. Ms. Bernard teaches two sections of our sophomore literature class, Advocacy Through Storytelling, and three sections of American Literature. Ms. Bularzik providing instruction on Aristotle’s Rhetorical Triangle. 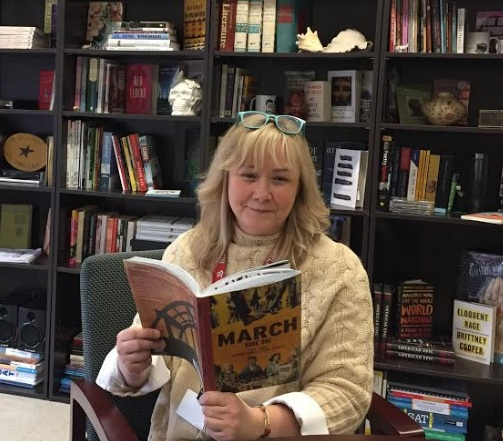 Ms. Crossman teachers three sections of our sophomore literature course, Advocacy Through Storytelling,; co-teaches our American Literature Foundations class; and serves as the English Department’s liaison to the Bridge program. She is also the co-advisor of the Tenacity Challenge, the IDEAS student leaders, and the VIEW student representatives. You can reach Ms. Crossman by email at crossman@bpsk12.org or phone at 781-273-7081. Mr. Hill teaches three sections of our ninth-grade Introduction to Literature class, one section of Advanced Placement Language and Composition, one semester of Drama and Advanced Drama, and one semester of Creative Writing Fiction. Mr. Hill also serves as the director of our annual fall play and the advisor of BHS’s improv troupe, Idle Hands. Ms. Lee teaches four sections of Senior English and co-teaches our ninth-grade Introduction to Literature Foundations course. She is also a co-advisor for the Class of 2021. As the department’s in-house tech expert, Ms. Lee serves as an unofficial advisor to students working on their digital products. You can reach Ms. Lee by email at alee@bpsk12.org or phone at 781-238-5642. Ms. Netishen teaches two sections of ninth-grade Introduction to Literature, two sections of Advanced Placement Language and Composition, a semester of Introduction to Film and Media Studies, and a semester of Advanced Media Studies. She is also the advisor of the Burlington High School chapter of Girl Up. You can reach Ms. Netishen by email at jnetishen@bpsk12.org or phone at 781-238-6801. Ms. Shalkoski teaches one section of sophomore literature, Advocacy Through Storytelling; three sections of American Literature; one semester of Leadership and Social Change; and one semester of Introduction to Film and Media Studies. She is also the advisor of the BHS literary and art journal Collab. You can reach Ms. Shalkoski by email at kshalkoski@bpsk12.or or phone at 781-238-6895. Ms. Smetana showcasing the independent reading texts her students have chosen this year. Ms. Wolfenden teaches three sections of American Literature, serves as an RTI in the district, and contributes to the town’s after school programs. You can reach Ms. Wolfenden by email at jwolfenden@bpsk12.org or phone at 781-238-6887.